NBAA provides key resources for administrative and management issues associated with the use of business aircraft. Topics include to aviation taxes, insurance, personnel and compensation. The NBAA Management Guide is an industry how-to manual for business aviation management. Recognized as one of NBAA’s most popular member benefits, this publication assists flight departments with operational, maintenance, administrative and other considerations. The NBAA Compensation Survey is an indispensable business tool to help NBAA members create and run the most effective and efficient flight departments. Conducted annually, this industry survey provides a comprehensive review of aviation department personnel salaries and benefits to help member companies better evaluate their flight departments. Strong leadership is the key to the success of any organization and certainly a key part of success in a business aviation organization. Safeguarding the business aviation industry for generations to come requires aggressive and thorough succession planning. NBAA's Internship and Career Guide is a tool to help companies identify and engage future industry leaders. Access latest issues and best practices information related to hiring and managing personnel. Get details on ownership and utilization options: full, joint and fractional ownership as well as interchange agreements, leasing and charter. 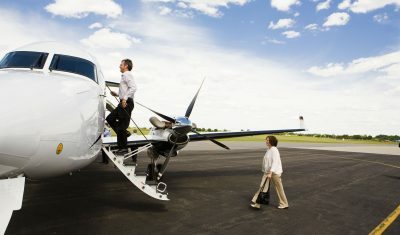 Learn about NBAA's Small Aircraft Exemption. Information on like-kind exchanges, the Cape Town International Registry and other topics in aircraft acquisition. In-depth information about state and federal aviation tax issues including depreciation, featuring the NBAA Federal Excise Tax Handbook. Review SMS fundamentals, including the International Standard for Business Aircraft Operations (IS-BAO). Review reports on international travel conditions submitted by fellow business aircraft operators – and submit your own. Sign up to receive email alert messages from NBAA Air Traffic Services (ATS) at the FAA Air Traffic Control System Command Center about airspace issues that impact on NBAA Member flight operations.